ADAMS COUNTY—Travelers can expect several daytime closures Thursday, Nov. 1 through Saturday, Nov. 3, as crews finalize the new traffic alignment for right-turning vehicles from eastbound 120th Avenue to southbound I-25. Because this requires paving, crews are taking advantage of favorable weather during the day to complete this work, which will ultimately reduce congestion in the area. All work is weather permitting and subject to change. Motorists should plan to add 10 minutes to their travel time to detour around the closures. All other lanes will remain open. 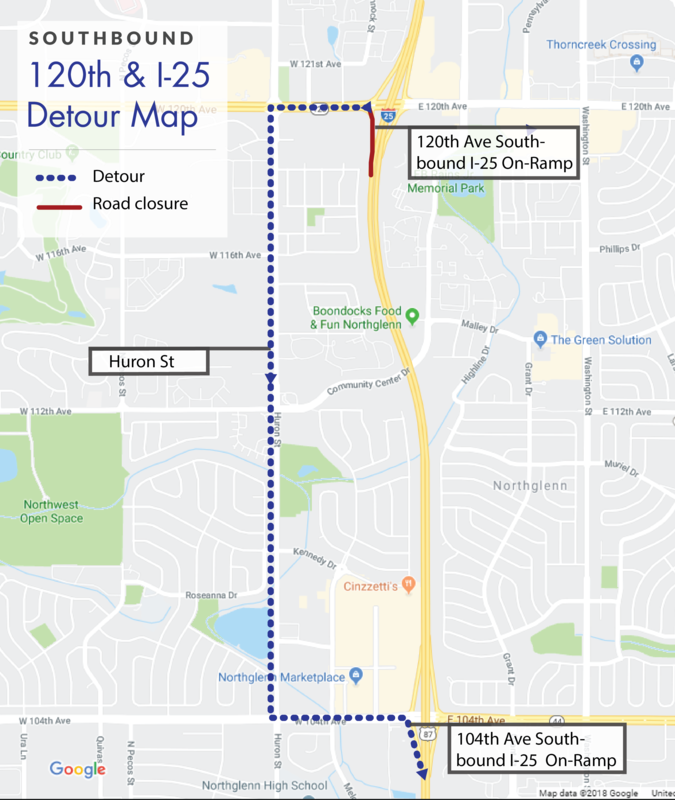 6:30 a.m. - noon Saturday, Nov. 3, 2018 Full closure of the 120th Avenue on-ramp to southbound I-25 Travel west on 120th Avenue, south on Huron Street, then east on 104th Avenue to reach southbound I-25. Construction will take place from 7 a.m. to 4:30 p.m., Mondays through Fridays, with periodic night and weekend work. Motorists can expect various lane closures on in both directions of I-25, as well as periodic ramp closures. Traffic will be maintained during peak travel times throughout construction. The North I-25 Express Lanes project from 120th Avenue to Northwest Parkway/E-470 is a $97.5 million project that will improve safety, capacity and user choice to a rapidly developing region. This project will continue the previous Express Lanes project, which was completed on I-25 between US 36 and 120th Avenue, and will extend the Express Lanes to Northwest Parkway/E-470. The project will add capacity on I-25 up to Northwest Parkway/E-470 and construct a new asphalt surface from 120th Avenue to Colorado Highway 7. Motorists can expect the roadway to be in its final alignment by early 2019. Express Lanes increase roadway capacity and help to manage congestion on the highways. The use of toll pricing during peak travel times reduces delays, manages congestion and maintains reliable travel times. Express Lanes currently are open between 120th Avenue and US 36 on North I-25 and, US 36 from Denver to Boulder and on the I-70 Mountain Express Lane. Learn more about Express Lanes, or visit ExpressToll to get an account or pass. Smart Commute Metro North is offering some incentives to help you commute smarter! Learn more or sign up.